Are you ready to make your ride stand out with a stripe kit? 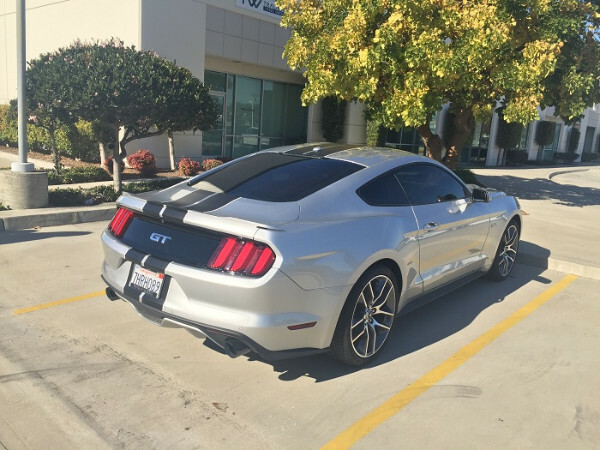 We just recently worked with a client who purchased this kind of product for a 2015 Mustang. Manufacturers make it look so simple when ordering these automotive enhancements. Order the kit and then “easily” install the product. In fact, an automotive striping installation is rarely ever easy. 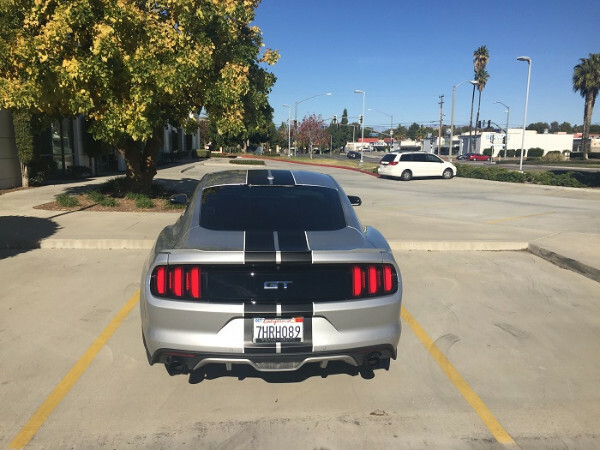 Since this client knew that we offer vinyl car stripes, decals and automotive striping installation in Orange County, CA, one phone call made this a quick and simple process for her. Awesome vinyl stripes for this Mustang! These Mustang stripes were ordered online and we were happy to install them! We started by measuring the stripe lengths and then laid out the product to ensure complete coverage of the targeted area. Since this kit included a black striping setup as well as a white pin striping product for the edges, we duplicated the process. Using specialized tools and vinyl vehicle graphic installation expertise, our technician installed the black stripes first. Next, the pinstripes took their places to define the edges. The color contrast of the black and white matte finish display on the silver color of the vehicle is truly eye-catching. We also offer truck striping! You already know that we specialize in the design, manufacture, and installation of a broad range of vehicle graphics, lettering and stripes. 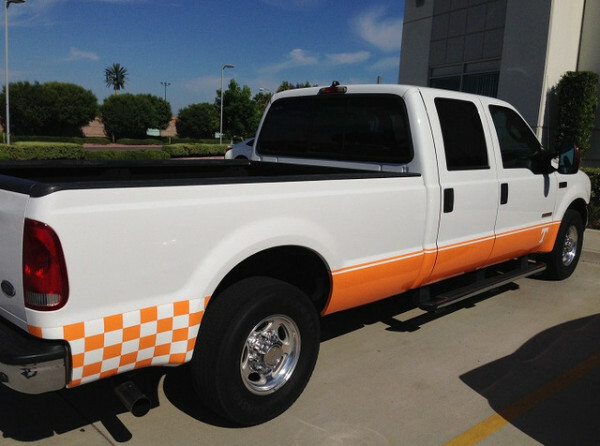 For example, you may remember the orange on white rocker panel stripes we created for a client who is a Tennessee alum. The back features a checkerboard look while the front portion is a solid orange line. 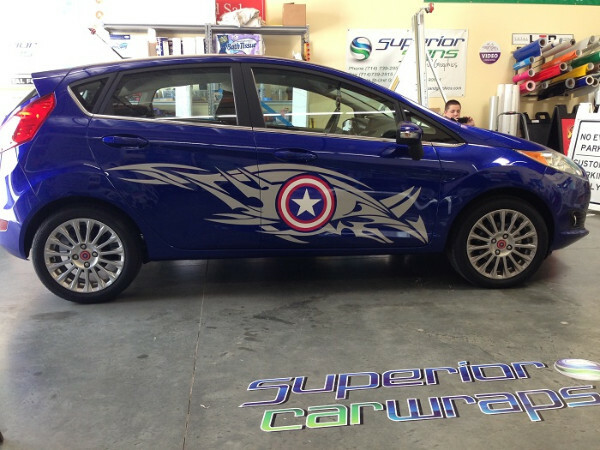 Then, there was the Captain America striping and decal installation. We designed and manufactured these graphics to suit the car’s make and model. Of course, we have also done stripe kit installations. A dark blue vehicle featuring matte black stripes, without a pinstripe, started with a pre-purchased package. Why Should You Entrust Your Vehicle Beautification to Us? We can fabricate and install car decals! In a word? Expertise. Our graphic artists have honed their skill of adapting graphics sizes to suit the sizing of the vehicle as well as any add-ons that you may have installed. We understand that your vehicle is more than a functional grocery getter. In fact, we routinely work with private clients who see their cars or trucks as extensions of their persona. As such, they ask us to create color change wraps, customized graphics or unique subliminal image displays that highlight the beauty of the vehicle and ensure that their cars are easy to recognize by onlookers. For those who purchase stripe and other graphics kits, we take the guesswork out of the installation. Make a mistake here, and you turn your ride into a mix of air bubbles, mismatched seams and crooked stripe displays that do not imbue your vehicle with the attitude you are hoping to portray. Entrust the installation of any kit to our experts. Not only do we have all the right tools on hand, but we also know how to prep your vehicle for the installation. Contact us today to learn more about vinyl car stripes and automotive striping installation in Orange County, CA.